A diet that focuses on a variety of vegetables, fruits and whole grains can be beneficial to cancer patients because many of these foods are known to boost immune function while helping to detoxify the body. Freshly extracted juice blends that include carrots, broccoli, celery, parsley, oranges and lemons are also ideal due to the fact that they avoid the digestive process and instead deliver nutrients directly into the bloodstream. Stevia is an herbal sweetener that is 100 times sweeter than table sugar, yet does not cause blood sugar levels to rise. Nobel prize winner Otto Warburg discovered that cancer cells no longer metabolize oxygen for their energy needs as healthy cells do, but instead they feed on the fermentation of glucose (sugar). For this reason, Stevia may be the ideal sugar substitute for those who are fighting cancer. Celery alkalinizes the bloodstream and purifies the blood. It also improves digestion, aids kidney, adrenal and liver function, while it enhances the activity of white blood cells. Celery may halt cellular fermentation, while promoting carbon dioxide elimination. Celery is a natural diuretic, and an excellent source of magnesium, iron, calcium, potassium and vitamins A, C, E and B-complex. Carrots are the best natural source of beta carotene, a form of vitamin A that is critical for proper immune function. Beta carotene is also a powerful antioxidant and can dissolve the protective coating of cancer cells so the immune system can destroy them. Carrots are also a good dietary source of antioxidants, vitamins B1, B2, B6, K and folic acid. Parsley is rich in iron, calcium, potassium, vitamins A, B1, B2, B3, B-complex and has thrice the vitamin C as oranges by weight. The high level of potassium found in parsley is believed to be responsible for its ability to stop tumor growth. 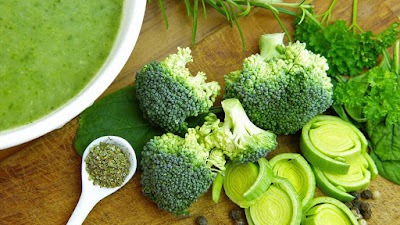 Parsley is one of the richest sources of the antioxidant glutathione, which helps bladder, kidney, liver, lung, stomach and thyroid functions--all essential to proper detoxification of the body. Lemons are a rich source of vitamin C and potassium. They also contain citric acid, which lowers the viscosity of the blood by taking water from the body tissues. In doing so, it prevents fermentation of the cells. Fermented cells are a breeding ground for cancer. Lemons also contain citrin, which helps the blood flow freely through even the tiniest capillaries.